Hi everyone! We've got an addicting game preview for you today, Cave Brain. 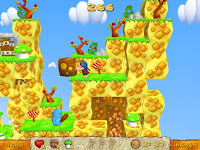 Can you help our caveman hero push rocks, smash crates and avoid traps as he solves each level of this arcade puzzle game? Dragons, Blue Goblins and Mad Mushrooms will do their best to stop you, but you can get rid of them by using your Novint Falcon to push boulders onto their heads, or to use your giant hammer to smash your way to victory. You’ll also use the Falcon to activate magical springs and teleporters, feeling your character’s movements throughout the diverse and magical environments. Play in two different modes: Arcade and Logic Modes. You can even add your favorite MP3 music files to put your own personal groove into gameplay. Look for this game in June! It's only $14.95!